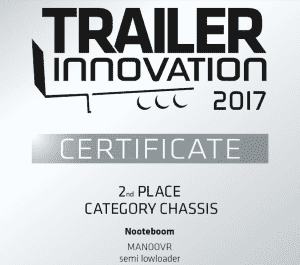 Nooteboom Manoovr semi lowloader wins Silver Medal at the Trailer Innovation 2017 category Chassis at IAA in Hannover. This is already the 4th price the Nooteboom MANOOVR has been awarded with for this breakthrough innovation. We congratulate our supplier SAF-Holland who has won the Gold medal at the Trailer Innovation 2017 category Chassis for their Driven trailer axle for tipper-trailers.